pull-throughs and they have shade trees which are a real plus in this area." The pool & hot tub are heated and ready to enjoy! Located only 3 miles south of downtown Moab on Hwy 191, just minutes from Dead Horse State Park, Arches, and Canyonlands National Parks. After a day exploring the scenery that Moab and the surrounding area have to offer; return to our park and relax; enjoy the beauty of the red rock cliffs, stunning views of the La Sal Mountains and picturesque sunsets. The New Pool and Spa are finished. Enjoy the Spa on cool evenings and the pool after a great day out in the parks hiking and Jeeping. We think you really enjoy the addition. Also finished a new T.V. lounge in the newly remodeled registration building. New washers and dryers and new bathrooms. Great place to watch a game or event after a day out. Yes, the pool is heated. Friendly people, great location and views! "Friendly people, great location and views! The sweet gal at the front desk even gave us a discount because it was our 5 year anniversary. Who does that these days!!" "My husband and I stayed at Spanish Trail RV Park from August 15-18, 2016, while touring the national parks, in a motor home. It was a great campground. We have been traveling for 70 days and this was one of the best places we stayed. The office personnel were wonderful, and we dealt with 3 different people during our stay. All were very pleasant and helpful. The spaces each had a patio which was such a nice feature. You were not dragging dirt inside your rv. The bathroom facilities were spotless and very roomy. We liked that they were secure, also. The laundry facility were very nice and clean. In our opinion this campground was excellent. We were sorry to be moving on, as our experience there was very positive." Fantastic RV park that we will use again when in Moab. Mgmt was great and campground clean w great views from each site. Full 50 amp hook ups and great water pressure too. Easy access to parks and Moab. Highly suggest to visit Moab and stay at this RV Park. Be sure to visit Arches and Canyonlands NP's. We had Jeeps to explore off roads which included many trails from desert to mountains. Love that they could accommodate my 45 RV motorhome, loved the grass at my site and the extra parking, The staff was the best!! They were very helpful in directing me to the best hikes in Moab. Wonderful bathrooms they were so clean and the water pressure was amazing, the laundry room was just as nice. I will be back. "By far, one of the nicest parks I have stayed. Courteous, friendly, helpful, great facilities!" - Jason K.
"First, we drove thru Moab to get here and got a chance to see the other parks. Most were just dust parking lots. They looked tight and no grass. This park has grass at each site, small patio, shade trees, dog walk and park. We checked in after hours and Helen was terrific. Our site was a full hookup with 50 amp pull thru. There was room to park our jeep. We have a 35 ft motorhome. Our site was about $45 w/ discount. It really is a nice place. Convenient to Moab and Arches and Canyonlands National parks. It's clean and we'll taken care of." "I highly recommend this park if you are visiting Moab and Arches National Park. It is on the south side of Moab and you will drive past several other RV Parks to get there but the extra couple of miles will be worth it. Take a look at the picture there are healthy mature trees and well maintained green grass here. That alone should tell you of the efforts of the staff to make this an oasis in the desert. The facilities are well maintained as well. I would strongly suggest making your reservations ahead of time as the park does fill up. There are many dining options in Moab and some amazing shops to browse. Arches National Park is a photographers dream and no matter how much time you plan to be there it will not be enough. Visit once and you will be drawn back like a moth to a flame." "I highly recommend this park if you are visiting Moab and Arches National Park. It is on the south side of Moab and you will drive past several other RV Parks to get there but the extra couple of miles will be worth it. Take a look at the picture there are healthy mature trees and well maintained green grass here. That alone should tell you of the efforts of the staff to make this an oasis in the desert. The facilities are well maintained as well. I would strongly suggest making your reservations ahead of time as the park does fill up. There are many dining options in Moab and some amazing shops to browse. Arches National Park is a photographers dream and no matter how much time you plan to be there it will not be enough. Visit once and you will be drawn back like a moth to a flame." "Nice well maintained. Good variety of sites. Some shade. Friendly service. Just outside of Moab proper. Nicer of the surrounding RV parks. Would definitely go back. Across the street from a good local restaurant." This is the best RV park ever. "This is the best RV park ever. From the time you are greeted to setting up & finding the best places to eat in Moab, Utah. It is very close to the Arches National Park as well as Canyonland National Park. These two parks are a must, every corner you turn is breathtaking, make sure to bring your camera. This RV Park is very clean & everything is updated. Wonderful for your pets. The staff is the best ever. Congrats to Loni & the other wonderful staff gal who helped us with everything. This is definitely one of the favorites in the area as it is booked out every day. A gift to stay here, hopefully, one day we will be back." "Our family vacation was a round robin trip through the west. Spanish trails was the best camp ground out of the 7 we stayed in over 2 weeks. A little bit out of Moab itself, but very easy access. Bathroom/showers and laundry facilities were clean and functional. The wifi was not operational, which was a bummer for the teenagers, however, with so much to do in Moab, it wasn't too bad. Very friendly staff." Stay here during "Rally on the Rocks" Great pull thru site with full hookups. The camp host very helpful about where and what to do. Their restaurant suggestion were superb! We'll deffently be back next year. Has to be the prettiest park in the area. The bathroom had to be the cleanest of any we've stayed in the last 20 year of camping. Number 1 in my book. "We have had the most pleasant stay at this park. Nice and Clean a bit from town but we actually liked that after all. Hubby and I along with our 2 furries stayed for 6 nights while attending a Jeep Rally. Great Wi-Fi (compared to most) Grass at each site, some have larger trees then others. We stayed in site #302 which in is the 3rd row, I don't recommend the first row (even though the views are amazing) the street noise is quite loud. Nice Laundry & Restrooms. They Don't allow wood fires, so if you want a campfire bring your own gas one. We would definitely stay here again." You ask for and the price is great!!! We will be back." 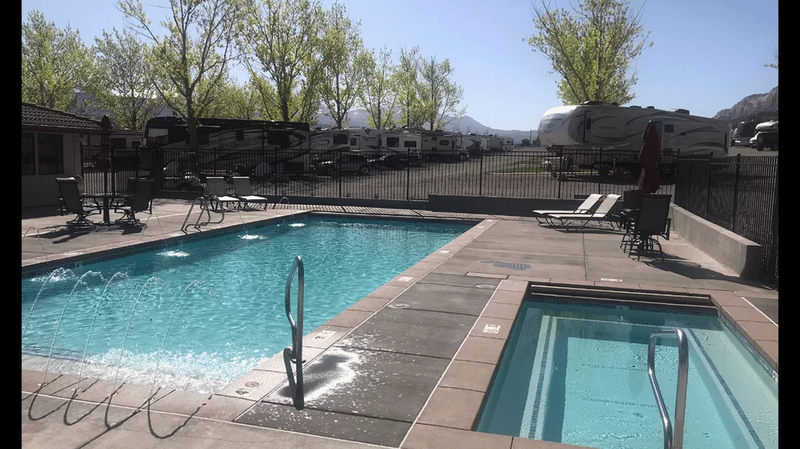 "Very clean, hot showers, grass at your campsite, Laundromat, pet walk, drive through RV site, tree's at each camp site, 50 & 30 amp, cable, what more could You ask for and the price is great!!! We will be back." "The spaces were all pull-through, plenty of distance between them, lanes easily navigated, a shade tree between each space. Shower rooms were very clean and light. Laundry room was big and well equipped. I loved waking up to the sunrise on the nearby red rock cliffs and seeing snow capped La Sal Mountains in the distance. Highway 191 traffic was minor; not bothersome. Loni and staff were helpful in researching events. My husband and I stayed here on way to and from Arizona. Highly recommend." This is the best RV park ever. From the time you are greeted to setting up & finding the best places to eat in Moab, Utah. It is very close to the Arches National Park as well as Canyonland National Park. These two parks are a must, every corner you turn is breathtaking, make sure to bring your camera. This RV Park is very clean & everything is updated. Wonderful for your pets. The staff is the best ever. Congrats to Loni & the other wonderful staff gal who helped us with everything. This is definitely one of the favorites in the area as it is booked out everyday. A gift to stay here, hopefully one day we will be back. "Love this park. Clean and level sites. 50 amp service. Laundry and wonderful showers. Love the walking path around the park for your dogs and the enclosed dog run. They even have doggie duty clean up stations. Great touch. Fantastic laundry facility. CLEAN - organized with everything you need. A+ restaurant across the street is awesome if you don't feel like cooking. Shell station also across street to fuel up your off road vehicle before you go exploring. We will be back. This is a great park." Awesome find in busy Moab, very well maintained and layed out. These folks understand that people coming to Moab bring toys, lots of toys. Room for Jeep and ATV trailer parking, long sites with no hidden gotchyas. 50amp power, cable, level sites with nice stamped concrete patio. You can pay more but you wont find better. Staff is friendly and and on task. This is a very well-run RV park. The staff is very friendly and helpful. The Wi-Fi and cable TV are superb. The grounds, laundry and restrooms are modern and clean. There are ample dog walking areas on perimeter of the park. All of the spaces were filled with vacationers in newer, high-end motorhomes, fifth-wheels, and travel trailers. There are lots of pull-thru sites for the larger vehicles.